Use this handout as part of your lessons using the book Cloudy with a Chance of Meatballs. 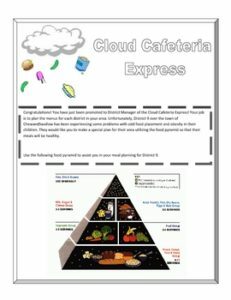 *Students have just been promoted to District Manager of the Cloud Cafeteria Express. District 9 over the town of ChewandSwallow have been complaining of off food choices and childhood obesity. It is the students job as district manager to create a menu for the town that focuses on the food pyramid.